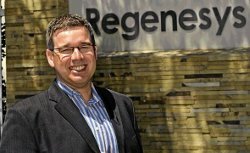 Brett Cousins hopes the offer of free online business education to anyone with access to the Internet will help Regenesys Business School achieve its ambition of being the world’s most “recognised” school by 2020. Johannesburg-based Regenesys announced in November that its full suite of online learning programmes – certificate, diploma, bachelor’s, honours and master’s – would be freely available to all. Only if they decide to pursue a formal qualification through Regenesys will they have to pay. “For those people who want the knowledge but not the qualification, it’s theirs free,” says school CEO Cousins. He says initial response to the offer suggests Regenesys will meet its target of 1m registered online users within three years. Many will come from SA but he also expects strong demand from the rest of Africa. There has been interest shown from Europe, North America and Asia. Free education is a Regenesys “gift to SA and the world”, says Cousins. “We believe that through this offering we are supporting and empowering individuals, and promoting economic development and competitiveness within the context of a rapidly growing knowledge economy. But the offer is not altogether altruistic. He hopes the 1m online users will translate into between 10000 and 100000 paying customers. It is also part of a long-term strategy to raise Regenesys’ profile and status. That has been the case both for individual students and for the companies that sponsor them. But the image may be changing. “We may still not be first choice for some but we are becoming an option of choice rather than necessity,” says Cousins. The school’s belated move into executive education – offering custom-made management programmes for companies – is gaining acceptance. Nedbank and African Bank are among its clients. Cousin says: “We are providing middle-management training for Nedbank, at supervisory level. We hope the quality of what we are doing will persuade the bank to endorse us when we try for senior-management training at some time in the future. He expects to attract more corporate business through Regenesys’ free online education. A number of companies have said they will encourage their staff to take up the school’s offer, then sponsor those who will benefit from more formalised training. It has taken time for Regenesys to gain broad acceptance. In its early days, the school marketed itself mainly to the public sector.It is one of four SA private schools accredited to offer a master’s in business administration (MBA). But its initial marketing of the degree, promising “emotional and spiritual intelligence”, raised eyebrows. Traditionalists (and some other schools) asked what spirituality had to do with a programme intended as a practical preparation for senior management. “We had to convince some people we are not a cult school,” says Cousins. Education authorities are convinced. The Council on Higher Education recently extended the school’s MBA accreditation. The message appears to be getting through to others, too. From 50 MBA graduates a year, the school expects to grow very quickly to 200. Though many study online, and the Sandton headquarters are used to only 40% of capacity, Cousins says Regenesys will not stretch its ratio of lecturers and tutors to students. The school has taken on “significant” numbers of new staff but will not accept more students than it can comfortably manage. Cousins admits it will always be hard to compete with established, internationally recognised competitors like Wits Business School and the University of Cape Town’s Graduate School of Business. But that doesn’t dampen its ambition. Whether by quality, respect or social legacy, “our vision is to be the most recognised business school in the world by 2020”.